Speaking of bugs. When I checked the Birthday counter today, one of the girls had her age in red. I tried to frefresh, but it was still there. I didn't really care about this small detail, but I guess Stryfe does. The reason why I chose to include three bars in each picture was to show that the colour on their ages were different. 18's a critical age, if you catch my drift. Regarding the slight sorting peculiarities, it's caused by leap years. I'll add a workaround sort soonish. 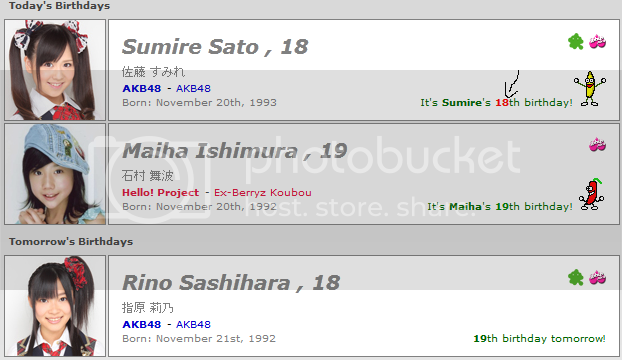 On the main page under "People by Category" it lists 243 people for AKB48. 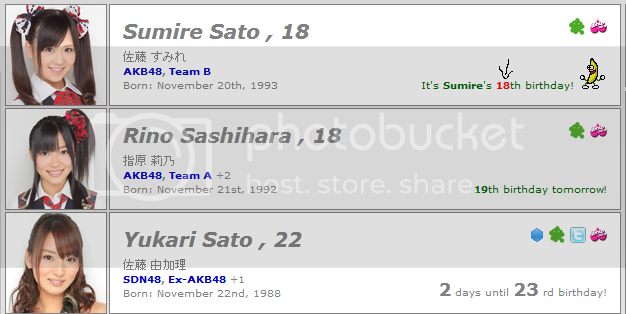 When you click AKB48 it lists 242! It says there is one girl with an SDN48 tag but that's not correct. It should be zero. When you click it it links back to the main page. Does this mean there's an empty/faulty entry somewhere? I wanna get rid of it. If there's no birthday set for the person, he/she won't show in the birthday listing, just on the info page. I... have a fetish for idols that are 2000+ years. It really turns me on! The first picture is from the main page under "Tomorrow's birthdays", and the second picture was when I clicked on her name to see her Bday profile. I was wondering if it was possible to hide age. Idols are robots after all, she must be an old model. Anyways, birth dates without birth years aren't supported, yet. That's why most of the Afilia Saga chicks don't show in the countdown, etc. Birthdates without birth years should be just added to the comments, for now. 1092 people at the db now! Quadruple digits just like that. In other related news, jafeijai (edit: and Melchizadek) added to the jolly ranks of the editors. 1092 1151 people at the db now! Quadruple digits just like that. Fixed. And we've only just begun! ^ That's Crazy! Also, Indonesian flag added. Feel free to add the country info into the db even before the flag icons are there, of course. Why Ai Shinozaki has no birthday countdown with other AeLL girls? I guess it's because she had an extensive modeling/gravure career before she joined the J-Pop scene. Added a simple free text search to the countdown page. You can also specify the search category. Flyp, Datalanche, Jul3 and kurosawa87. DB editors can now use a new feature I added for cropping 100x100 px portraits from large images. So no need for photoshop/gimp/mspaint hassle anymore, just find a good picture, upload it via the editor (new button below the old one), select the area you want as a portrait and click save. Any other suggestions regarding new features and stuff, shoot. I'm in the mood. If any of you still wish to continue editing, just pm me. Moderators and admins have automatic access. Adding and modifying people is simple with the web interface. For new people, you need a birthdate, a picture and preferably a little bit of information. Any category or all of them are fine. I can also help or assign people to add if you so wish. 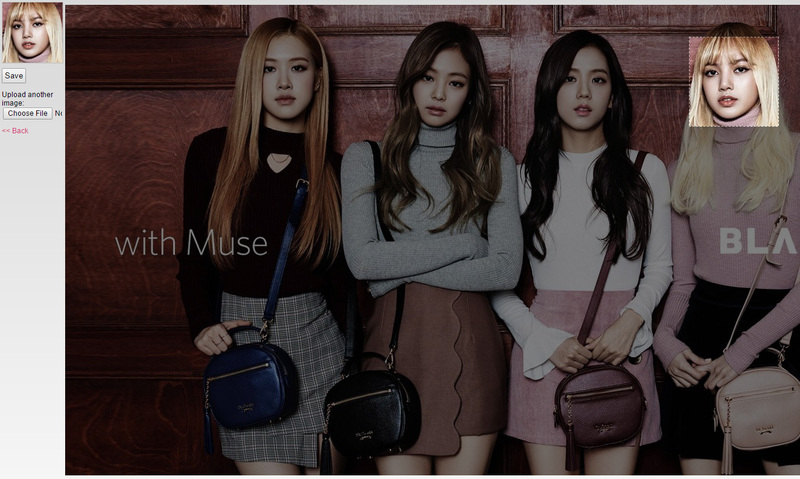 Latest group additions now visible on the main page. Also did some minor fixes and additions to info pages, regarding ex-members and such. Maybe some advanced search functionality next... the text search is actually pretty clever already but many features are hidden from view.